St. Paul, Minn. – Ruthann Godollei, Professor of Art, has been awarded the 2013 Thomas Jefferson Award. The award was established in 1961 by the Robert Earll McConnell Foundation to honor faculty members who exemplify the principles and ideals of Thomas Jefferson. Godollei was selected by a committee of past Jefferson Award winners. Provocative artist, inspirational teacher, and valued colleague, Ruthann has expressed the essence of an artist at Macalester College over the past twenty-five years. Her art is exhibited internationally with work shown in galleries, museums, and traveling exhibits in places such as Estonia, Belgium, Malaysia, New York, Mexico, Spain, Croatia, Poland, and Nicaragua, as well as in numerous locations in Minnesota including the Minneapolis Institute of Arts. Hers is a body of work that pushes boundaries. Art and civic engagement are inextricably bound together. Ruthann challenges us. She has taken on the big issues of the day through her art: gender issues – abuse of power – environmental destruction – honest self-assessment. And while most were silent, over the past two decades Ruthann, as an artist and our colleague, has not let us forget that we have lived amid two wars. Ruthann’s art, however, is not only aimed at serious social commentary, she is a champion of the “Art Car.” Certainly most at Macalester are aware of her green, hand-stenciled 1984 Volvo. And where else but here in Minnesota could you be co-creator of “Art Cars on Ice,” the world’s only Art Car parade across a frozen lake. Simultaneously humorous and serious, the scope of the art car movement is international as documented in her book co-authored with Eric Dregni ’90: “Road Show: Art Cars and the Museum of the Streets.” Ruthann’s involvement in printmaking and art cars extends to her role as­­­­ the organizer of numerous international print exchange portfolios and art car events. We applaud her pro-active, socially conscious, and street-wise presence within and beyond the Macalester community. The challenges of life as an active and acclaimed scholar/artist have not kept Ruthann from bringing joy and inspiration to the classroom. The impressive range of her artistic skills and interests are made evident through the courses she’s taught. 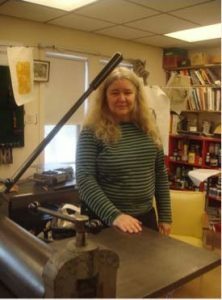 In addition to her focal area – Printmaking – she has taught such courses as Dissent, Women in Art, 2-Dimensional Design, Political Art, Images in Consumer Society, and Performance and Installation Art. Ruthann has been tireless in her service to the college. She has served on countless committees, often numerous times. Whether chairing the Educational Policy and Governance Committee, the Faculty Advisory Council, or the Art Department, contributing to numerous advisory committees often aimed at expanding opportunities for students and faculty-of-color and deepening Macalester’s commitment to civic engagement, or serving on almost every Search Committee across the Fine Arts, Ruthann’s contributions have enriched the quality of learning and life on our campus. It should be noted that Thomas Jefferson was a botanist and plant lover. Ruthann originally planned to major in botany in college and so, perhaps, it is especially appropriate that Ruthann be named as this year’s Jeffersonian. We thank you, Ruthann Godollei, and offer our congratulations on being selected for the 2013 Macalester College Thomas Jefferson Award.